Just when I think Gab Carbone of The Bent Spoon in Princeton absolutely cannot invent another flavor combo that will blow my mind, she does. In spades. I was lucky enough to share in George & Helen’s bounty. Their custom flavor of choice? Herb honey (Airborne brand, from New Zealand), candied pistachios, and fresh ricotta. Unbelievably good. I would have been happy for months going on the just the taste memory of that, but then last week I got to try another crazy-scientist-slash-culinary-artist concoction. Actually, several of them. Gab was responsible for dessert at the eight-course “Collaborative Feast: Princeton Chefs Give Back” dinner at elements restaurant. A portion of the proceeds from the dinner benefited the Princeton Community Foundation. Each course preceding dessert was rich and memorable, so when it came time for dessert my tablemates and I began mumbling about perhaps not having room for it. For the less adventurous, there are more conventional but just as tasty ice cream and sorbet flavors, including cookies & cream, chocolate cinnamon, mocha chunk, mascarpone, and Sicilian blood orange. The Bent Spoon team has created more than 500 flavors to date, all told. 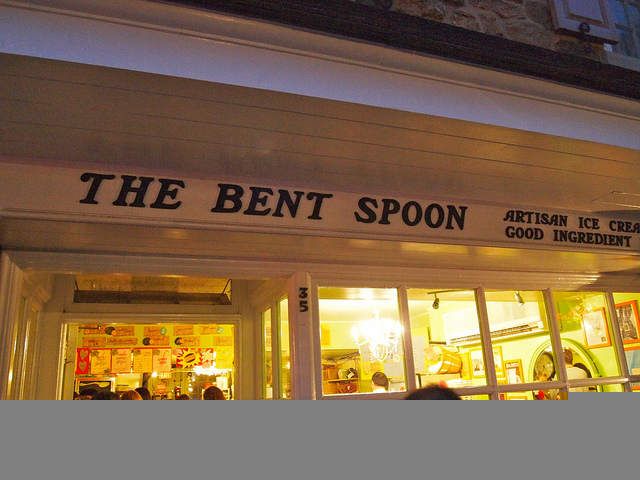 Here’s my first holiday shopping tip of the season: Gift certificates to the Bent Spoon! If you happen to have someone who doesn’t like ice cream on your list, cans of their ridiculously rich European-style hot chocolate mix can’t miss. And my daughters regularly give their friends super-cool Bent Spoon T-shirts, which feature a tiny map of NJ, reflecting Carbone & Errico’s dedication to using local ingredients. Check out this charming YouTube video of Gab and Matt at work.